How well the three Rs (reading, writing and arithmetic) are taught in the Foundation Phase, have long been the basis, and matrix, of a good education system. To parents choosing a Waldorf education for their children, this is one of the distinguishing factors of the Waldorf curriculum. In Waldorf schools we take our three Rs very, very seriously. So seriously in fact, that we use every school day of the first three formative years to get this basis just right. Some critics of Waldorf education might say that we are too slow in our approach (grade 1 learners in mainstream schools might be ‘reading’ to some extent by the end of the first term already), but we prefer terming it ‘thorough’ in teaching the fundamentals as well as in keeping with children’s natural development in learning. Proponents of unschooling have shown that even if you don’t teach a child to read at all, they will learn to do so in due course. In a recent study, academics at Stanford University have also proved that children who start formal learning at a younger age, have no significant advantage over their peers who start learning later; that formal academic instruction at an earlier age is no pre-cursor to academic achievement over time. And in the Finnish education system, the benchmark of government education systems worldwide (see their PISA results in relation to countries like the USA, the UK and lo and behold, South Africa), they also let their children only start reading once they start grade 1 – imaginative play is encouraged, and formal academic instruction discouraged during the first 7 years. This relates in a similar way to the TIMMS results for science and mathematics. How do we teach reading in Waldorf schools? Language, in the evolution of man, developed from the spoken word (stories carried over from generation to generation) to the written word (think hieroglyphics – in order to preserve stories and definitive moments in the history of mankind) and then naturally to reading. In a Waldorf classroom, we approach the process in much the same manner. During the first 7 years of a child’s life the emphasis should be on language development and in our Kindergarten we practise this with a rich story-telling culture. Story time becomes a ritual to the children and they look forward to it with big anticipation every day. The teacher will tell a story (rather than read), making the story come to life in the mind’s eye, with imagery embroidered with rich language, making eye contact with each child. This continues into primary school and becomes the modus operandi of learning the alphabet. 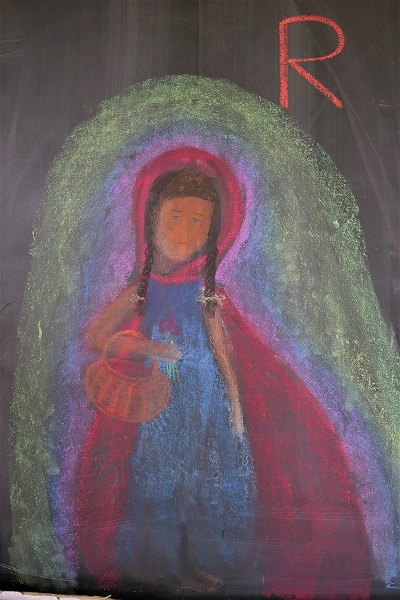 Say the children are learning the letter ‘r’: the teacher might tell them the story about Little Red Riding Hood (see picture of Melanie’s black board drawing above). An image in the story (in this case, Red Riding Hood’s cape) will have the shape of the letter in question. After listening to the story, the children will go outside drawing the letter in the sand with their fingers, constructing it with little rocks, leaves or twigs or finding it in unusual places like the markings on the bark of a tree; they will say rhymes, and sing songs with ‘r’. In this way the child forms a living relationship with each letter, again using their imagination so carefully cultivated and preserved during their Kindergarten years. A teacher will typically spend a day or two ON EACH LETTER. Once they have gone through the entire alphabet and having done sounds and double sounds, the teacher will write down a familiar poem on the board whilst saying it out loud. Some of the children, while copying the words from the blackboard onto their own books, will spell the letters out loud and start making connections between the words they know by heart, and the words they are writing down in their books. Finally, they will start reading. This process starts for some from about grade 2, and for others only in grade 3. In Waldorf classrooms we understand that with the correct support and encouragement, reading will happen in its own time when a child is ready. It is also important to note that reading entails deciphering skills, and that these skills mature in children at different ages. From speaking, to writing, to reading. In a society obsessed with achievement and 100% pass rates, it is difficult to justify the value of taking the pressure off our children and letting them take their time in mastering the basics of their academic careers. The irony is that our Waldorf learners fare just as well when they eventually sit down for their matric exams as their mainstream counterparts, in South Africa, as well as abroad – even if they took their sweet time learning to read. Just as any child naturally goes from sitting up, to crawling and then walking, or learn to speak their mother tongue by the age of three without the aid of a special tutor, worksheets or a dictionary, the same child will learn to read by having a strong bond with the spoken and written word.